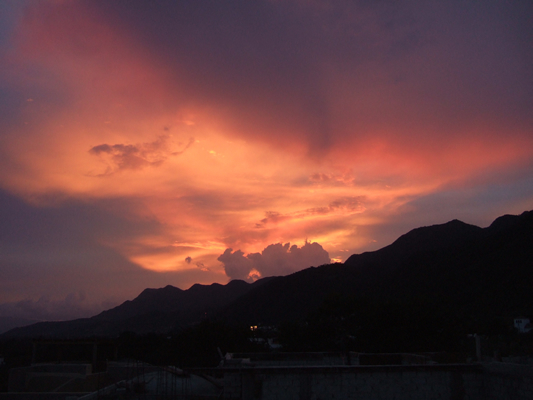 Having one of the world's best climates, Ajijic does not have the traditional four seasons. Rather they have a dry season (November thru May gets about 3" inches of rain) and a wet season (June thru October gets about 30"). 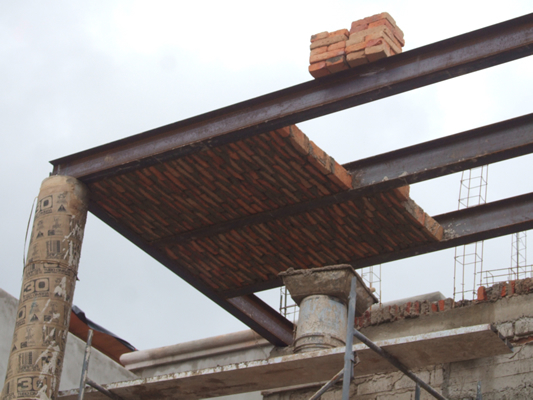 Our goal was to experience the wet season and to search for a home to rent for this coming winter. 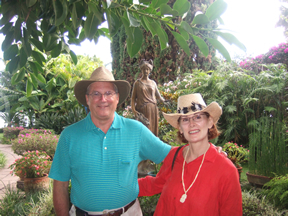 To email us, click here: Larry and Glorine. The first thing we noticed as we drove in from the airport was the lush green mountains surrounding Lake Chapala, as you can see in the background. 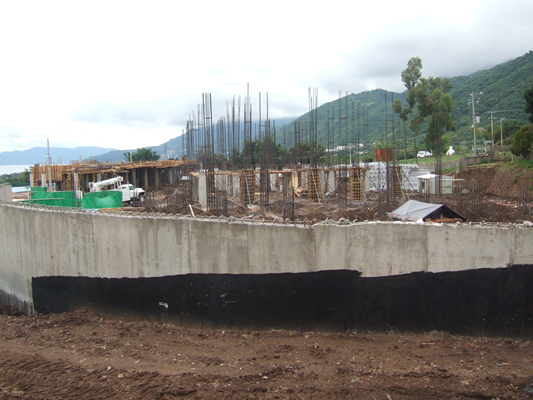 In the foreground, is a new housing development of villas and condos, one of which we shared with Maureen (Glorine's sister) and her husband Howard. Click to enlarge. 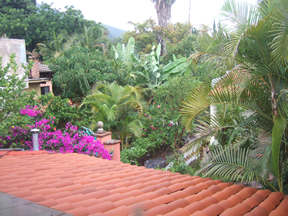 In addition to exploring and enjoying the sights and sounds of Lake Chapala, we spent about half of our time checking out homes and condos to rent for this coming winter. 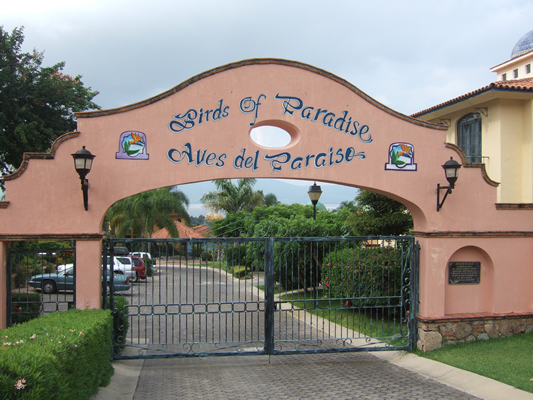 This gated community of condominiums called the "Birds of Paradise" is where Maureen and Howard decided to live for six months beginning in October. This development is aptly named because it attracts snow birds, sun birds (from Phoenix, Houston, etc.) 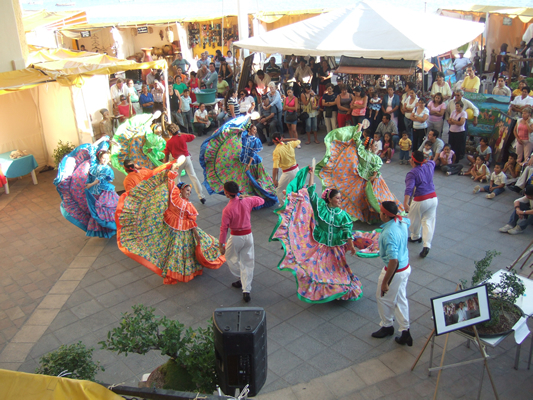 and sea birds (gringos who initially lived along the Mexican coastline and found the summer to hot and humid). Click to enlarge. 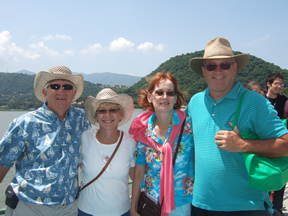 After spending ten days with us in Ajijic last winter, Maureen and Howard fell in love with it and decided to move here permanently and will be using the next six month to get the "lay of the land" and decide where they want to buy. While we found a great unit in Birds of Paradise, we decided to live in the village of Ajijic. 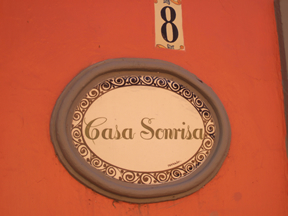 Casa Sonrisa or House of the Sunrise is one block from the Catholic church which is the heart of the village. Casa Sonrisa is a two-story home with the master bedroom on the second floor. The main floor has the kitchen, dining and living room. The second bedroom is in a casita which is on the back side of the garden/courtyard, noted above. Click to enlarge. We spent a lot of time in and around the lake. 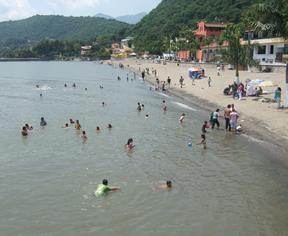 Here is a beach in Chapala, a community about five miles east of Ajijic, which was filled with kids swimming and playing in the water. 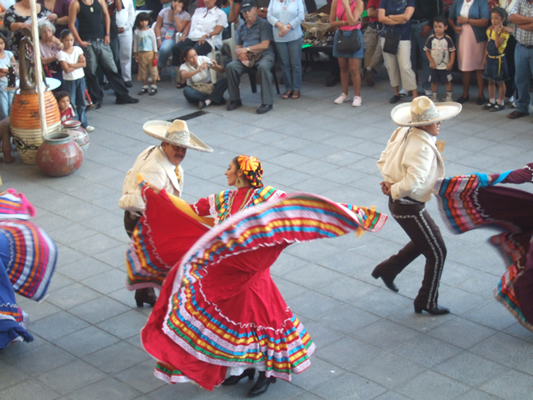 Most are from Guadalajara, who come down with their families for the weekend. 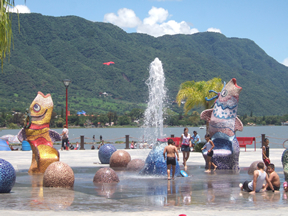 Chapala's Malecón, which is the main shoreline stroll way runs about six blocks along the lake and is filled with tourists, restaurants, and shops. 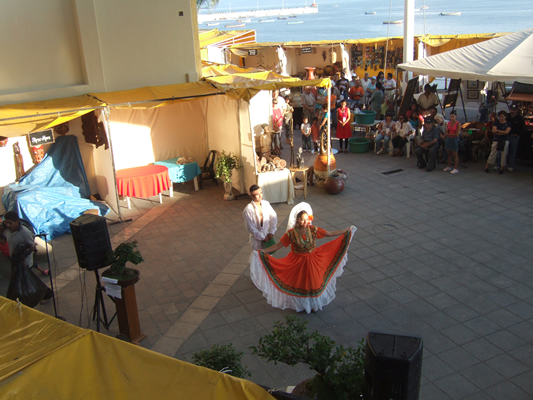 Here is a small amphitheater where we were entertained by Mexican dancers dressed in their traditional festive customs. Party time! Our friend Jeff, (bottom right) hosted a pool party for about a dozen people. We knew all but one person from our time in Ajijic this past winter. 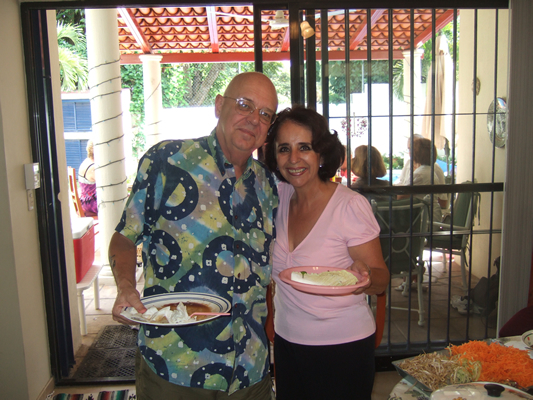 With Jeff (California) is Tere Buzali, a lady we met from Guadalajara. 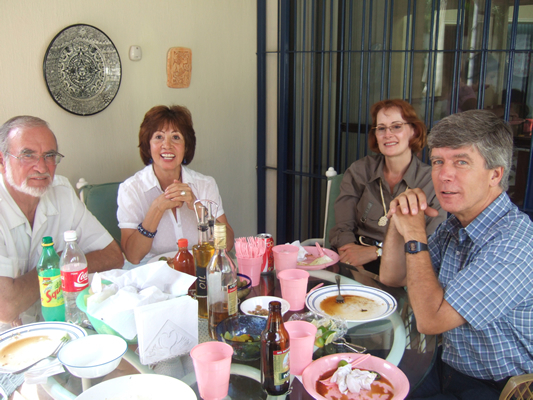 Top right are Quentin (Portland), Rose (Columbia, South America), Maureen and Norm (Canada). Bottom left are Siese (British Columbia) and Howard. It was a fun Sunday afternoon. 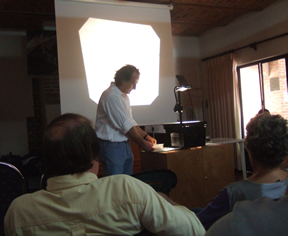 The Lake Chapala Society hosted Dr. David Truly, professor from Central Connecticut University, who has been studying the migration of Canadians and Americans coming to Ajijic over the past dozen years. While the climate and cost of living are among the top five reasons for this migration, "dissatisfaction with country" came up as the number one reason why the most recent wave of snow birds have moved here. Interesting!! 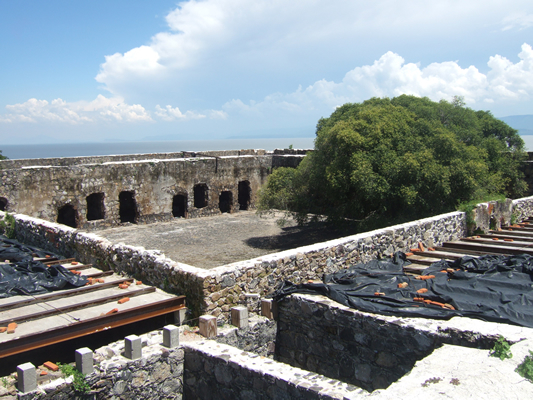 One day we spent exploring a region about 20 miles east of Ajijic along Lake Chapala that is inhabited by nearly 100 percent indigenous people whose ancestors lived here for centuries before the Spanish "discovered" Mexico. This unique area is both beautiful and historic, because the Mezcala Indians were relentless in defending their territory against the Spaniards. 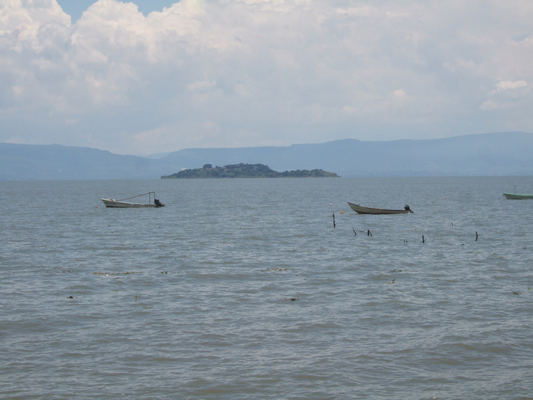 Along with a large region along the shore of Lake Chapala, the Mezcala Indians also controlled an island in the middle of the lake. It was here where the Spaniards tried and tried to conquer the Indians, and failed. Finally through a truce the fighting stopped and the Mezcala Indians were given special rights that other tribe of indigenous people were not given. 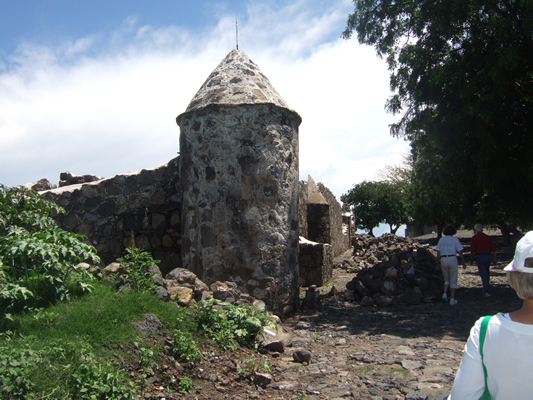 There were about 60 people who took a tour of the island and saw the remains of these historic ruins. Sunday Brunch. 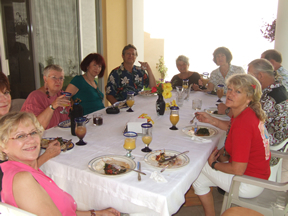 Glorine's friend, Sueki, hosted a great brunch at her home near Ajijic. 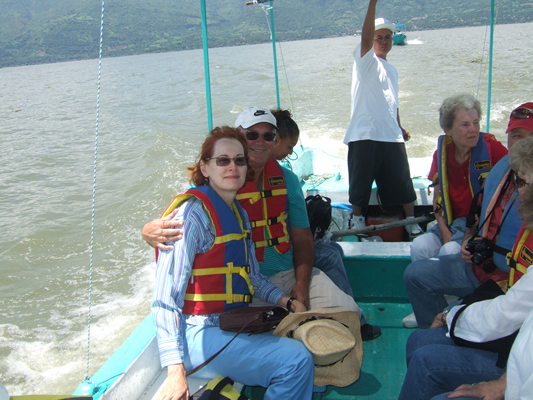 Here we started out as strangers, but got to meet some interesting folk who make Lake Chapala their year-round home. 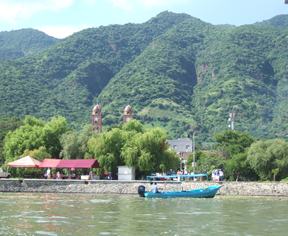 After brunch, Sueki took us to Jocotepec, which is on the western shoreline of Lake Chapala. This picture is of a new developed area along their Malecón. 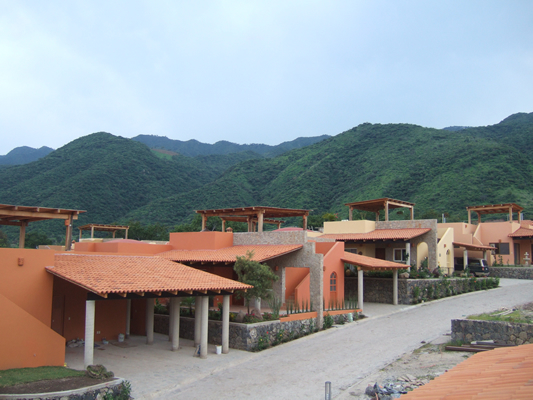 Unlike Chapala's Malecón, this one has no retail establishments but focuses on the lake. 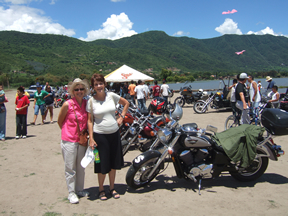 The same day we toured the Jocotepec Malecón, they had a motorcycle rally. Here is Glorine and Sueki pretending to be Motorcycle Mommas. 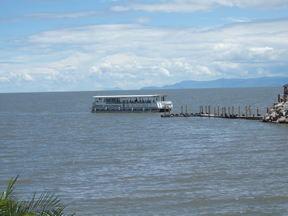 A new feature to the lake was a large tour boat that held about 40 people. We thought we would save this activity for this winter. 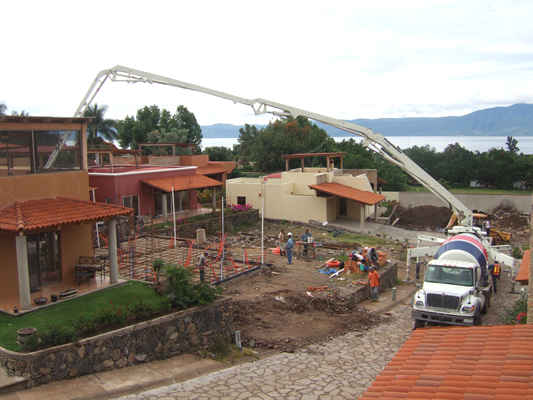 The villa we rented was a part of a major development that was under construction. 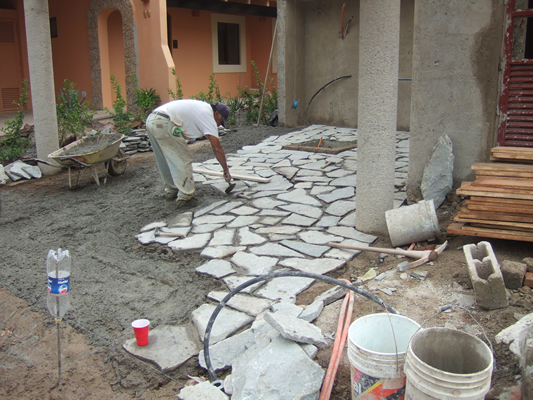 Here are a few pictures of the work in progress--from pouring concrete to laying a rock driveway to laying a brick ceiling. In addition to all the villas, this development was building a couple of five story condos, with a major swimming pool, tennis courts, and other recreational activities. 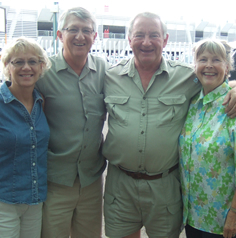 Our former landlords, Ken and Lisa Clarke joined us for drinks and dinner one evening. It was fun seeing them again. 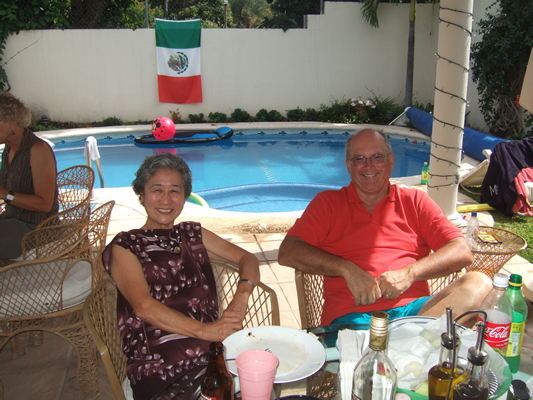 They are former Canadians, who moved to Ajijic ten years ago. 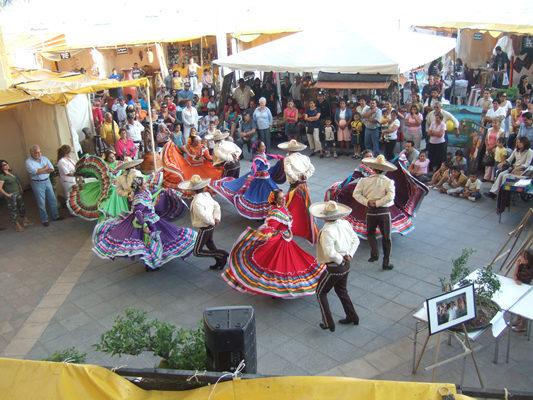 They were kind enough to drive us to the Guadalajara airport, about 20 minutes north of Ajijic. Augusts' web page includes August 7 through August 26, 2008, which was our summer trip to Ajijic, Mexico.